I don’t usually prefer cupcakes over a full cake because I tend to find cupcakes difficult to eat without getting frosting all over your face. However, you have to admit they are much easier for sharing, it can sometimes be difficult to transport in one piece. Not to mention you then have to find a knife and plates to cut and serve the cake. No, I think from now on if I need to take baked goods anywhere, I’ll be taking cupcakes not a whole cake. I love coffee flavoured anything, I find the bitterness of coffee cuts through any over powering sweet flavours. And of course the second the coffee hits my tongue it warms my grouchy little soul and makes the day bearable. So why not have your coffee fix in cupcake form. 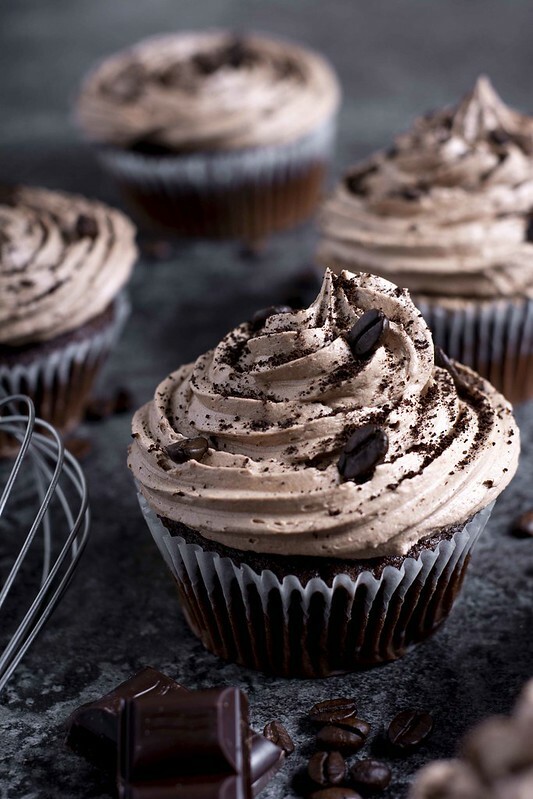 Mocha cupcake for breakfast anyone? 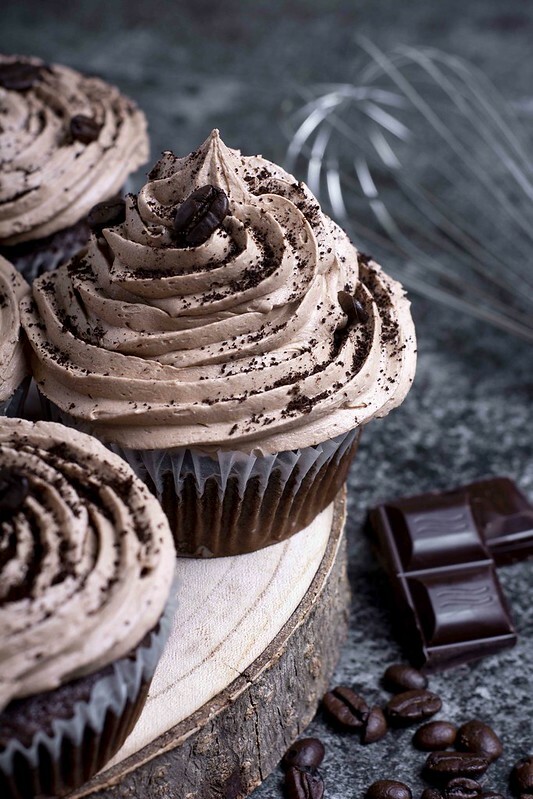 Rich dark chocolate mocha cupcakes. Preheat the oven to 160°C. Line a cupcake tray with cupcake cases. Melt the chocolate, butter, instant coffee and milk in a heatproof bowl in the microwave. Put the microwave on half power and heat in 30 second bursts until the mixtures melted and is smooth. Leave to one side. Sift the flour and cocoa powder into a bowl, then add the caster sugar and fold into the chocolate mixture. Lightly whisk together the eggs, vanilla extract and soured cream, add this to the chocolate mixture and stir well to combine. Transfer the mixture equally between the cupcake cases. Bake for 25-30 minutes until a clean skewer comes out clean when inserted into the centre of a cupcake. Set aside to cool completely before icing. With an electric whisk, beat the butter and icing sugar together until pale and creamy. Brew the coffee in the water, using either a french press or filter paper. Add the coffee to the buttercream and beat well. Add a little more sugar if it gets too runny. Place the icing into a piping bag fitted with a star shaped piping nozzle and pipe swirls on top of each cupcakes. Top these swirls with a few coffee beans and enjoy! 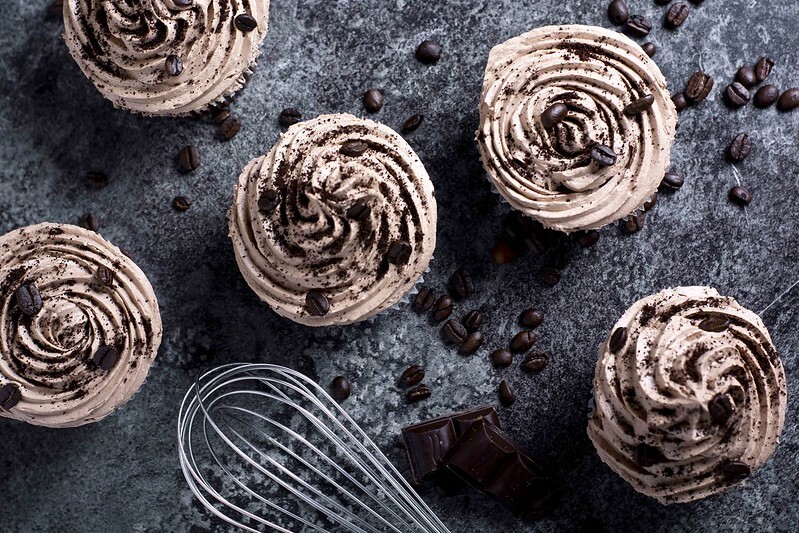 And there you have it, my coffee mocha cupcake recipe. Don’t forget to tag @whatseatingmanchester in your social media post to let me know how they turn out. I always love seeing your bakes! And please do let me know in the comments if you prefer cupcakes or a layer cake. For more simple baking inspiration check out my blog or Pinterest.